With names like “mother-in-law’s tongue” and “snake plant” it’s surprising that Sansevieria trifasciata is actually a popular houseplant. But the stiff, pointed, vertical leaves that give it such names actually make for a very appealing plant. Plus, it’s pretty easy to care for! Here are some tips on how to care for a mother-in-law’s tongue (aka snake plant)! 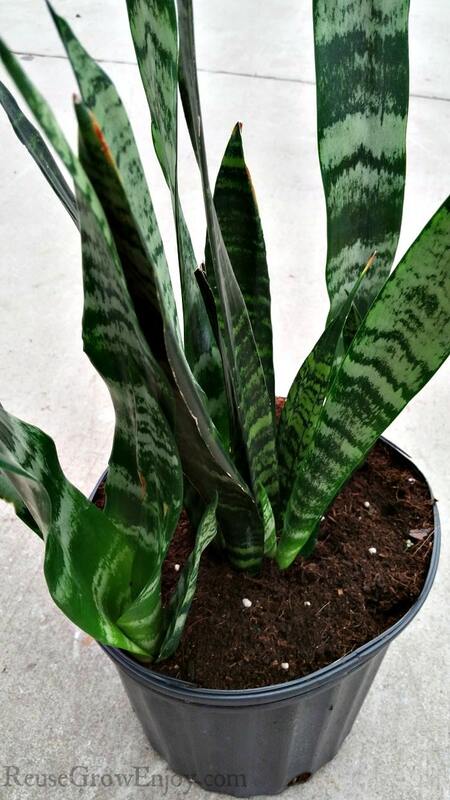 Mother-in-law’s tongues and snake plants are actually different varieties of Sansevieria trifasciata. If your plant has a yellow border to its leaves, it’s a mother-in-law’s tongue. 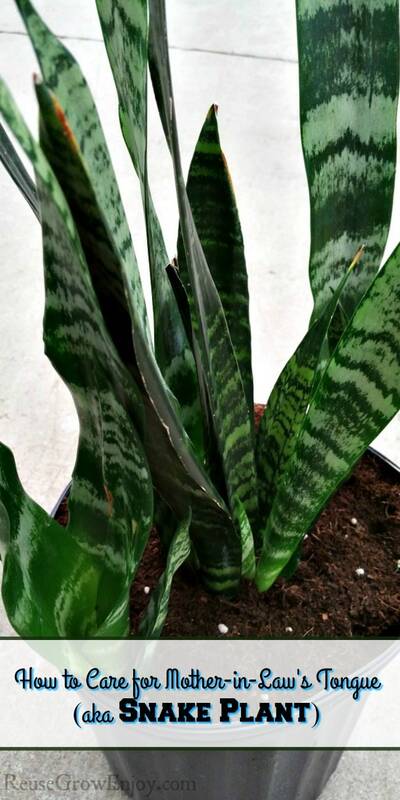 If it has green leaves with lighter colored horizontal bands, then it’s a snake plant. Along with those differences, there are also varieties that differ in height, with the shortest growing 1 foot tall and the tallest getting to be 8 feet tall! But all varieties can be cared for the same. If you want to properly care for a mother-in-law’s tongue plant, you need to get the right soil! A sandy, well-draining potting mix tends to suit them well. If your plant’s soil doesn’t drain well, you put it at risk of staying too moist and developing rot or diseases. Snake plants/mother-in-law’s tongues love to be root bound. That means it’s fine to keep them in a small-ish pot, and you can wait a while before re-potting your plant. It’s very easy to care for a mother-in-law’s tongue plant, as they’re actually pretty adaptable. In a perfect environment, your plant would have mostly indirect light, with some direct sunlight occasionally. But they’ll also do just fine in completely full sun, or in darker corners of the room. Mother-in-law’s tongues are plants that should not be over-watered, which is great if you tend to forget to water your plants! In fact, during the winter they really only need to be watered once a month. The rest of the time, wait until the plant’s dirt feels dry before watering. Snake plants prefer warm temperatures (their native environment is West Africa where it’s tropical). At temperatures below 50 degrees Fahrenheit, your plant will be in trouble. So make sure not to place it near cold windows, drafty doors, or vents. 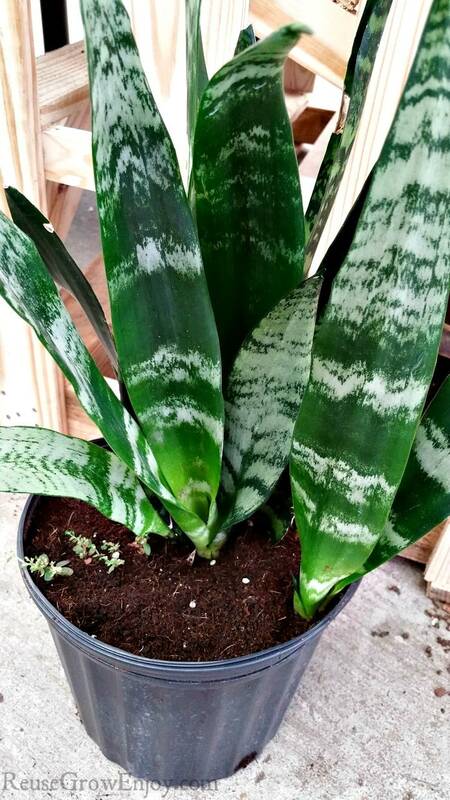 If you’re not that into fertilizing your houseplants, then the snake plant is the plant for you! They really don’t require much, if any, fertilizing. You can completely skip fertilizing them during the winter and just fertilize in the spring/summer when the plant is growing. An average all-purpose fertilizer tends to work well with snake plants/mother-in-law’s tongues. Mix it into the water of your watering can so the plant gets a little of it each time you water. So as you can see, it’s very easy to care for a mother-in-law’s tongue plant! And not only are they nice to look at and easy to care for, but they also have air purification properties. They’re particularly good at getting rid of formaldehyde in your home’s air (which may off-gas from things like furniture). So they’re pretty much the perfect houseplant! One word of warning- if you have cats or a dog that likes to eat your houseplants, be careful with mother-in-law’s tongues/snake plants. They’re poisonous to cats and dogs, though generally the effects are only mild to moderate in severity. Still, it’s best to play it safe and keep the plant away from your pets. Do you know if any of your other houseplants are air purifiers? If you would like more plant tips, here are a few other posts to check out.